When using IQRF I often dealt with the problem of handling obstacles that IQRF brings. Finally I realized that the best solution is to use something else .... some open-source solutions. 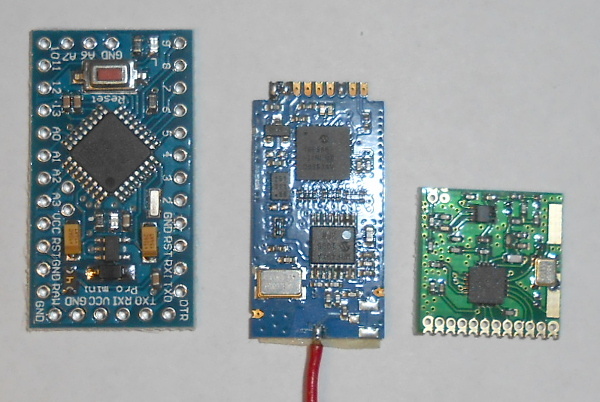 IQRF modules is nothing more than a device produced together with a processor and a wireless part. I have Arduino at home and it seemed to me that this is actually very excellent candidate. I brushed Arduino for which I had no greater utilization. And I started to research how to implement wireless communication with Arduino. The advantage is that the Arduino has excellent support and is simple to put into operation which means basically no initial barrier at the beginning of use. That is why I decided to create its own wiring with the microprocessor Atmel and wireless part. IQRF is final wireless platform with PIC processor. It is product from Czech company Microrisc s.r.o. . Finished wiring processor and wireless part. You can quickly try wireless communication. Microchip don't develop compiler for their 8-bit microchip. IQRF use CC5X compiler. Why rather use compiler SDCC ? CC5X compiler is close and commercial. For noncommercial use is compiler gratis, but has limited function. Small number of IO Pins. You can't direct access to memory! You need special hardware programmer and software for upload program. For real working you must be a programmer and learn to work with the device and study documentation of PIC processor. Arduino is open-source platform for prototyping with microprocessor Atmel. Excellent support for various OS. You can still use the phone. Standard interfaces for communication and programming: Serial Port. Ability to connect to different wireless peripherals - according to	the specific needs. Normal work with memory - direct access to memory. Can connect Ethernet, display (even graphic), GSM, GPS, etc. .
For all electronics are ready-to-use library with a good API. The first use is trivial - needn't to install anything, just unpack	zip archive! Exist lots of examples and even specific instructions for real application. Arduino is a very common device. You don't need any special software	programmer even any hardware programmer. For the development is not necessary OS Windows. It is possible to	use any OS, even computers with non-x86 CPU. I don't know about negative :-) . From my practical experience of using, I found that with Arduino is quick and pleasant development.